Climate change is serious, but it doesn’t have to be grim. At least not in the ways we come together to cope with it. We know it’s real and it’s terrifying. But, no one is better at turning serious, scary, and seemingly grim topics into open, easy, powerful, fruitful discussions than Abundance NC. Again and again they take on difficult topics of our time – like climate change, death, grief, the opoid epidemic, assaults on renewable energy, re-localizing food production – and transmit them into gatherings to create solutions through stronger, more meaningful community. One that honors our planet, offers deep appreciation for our loved ones both here and gone, and most importantly creates spaces, where we can be in each other’s company for much sought after mutual renewal. Because we need that. I need that. Join us today, May 13th, at the CLIMATE CARNIVAL, for yet another of Abundance NC’s brilliant and delightful community events addressing the most pressing topic of our time. The event is at the Plant, so you can count on festive lights and tents, good food, a local beer and spirits cash bar, and a playground. For our minds and hearts there will be well-informed, deeply thoughtful, and profoundly inspiring speakers. Audience questions and side conversations will take that to an even higher level. We can do what we so enjoy. Spend time hanging out, maybe to engage in climate change topics – or to talk on other topics, to think together, and to play. Creating the world we want to live in doesn’t have to be that hard. We can start right now, together with our friends – right here in our community. A while back I had the good fortune to talk with Frank Stasio, host of the NPR show, The State of Things. Frank is a thoughtful interviewer, and a fan of Slow Money. He was also instrumental in the opening of the Durham Coop in 2015 in Durham, NC. Thank you, Frank – for the interview, and for all you do to make our community a much better place to live. 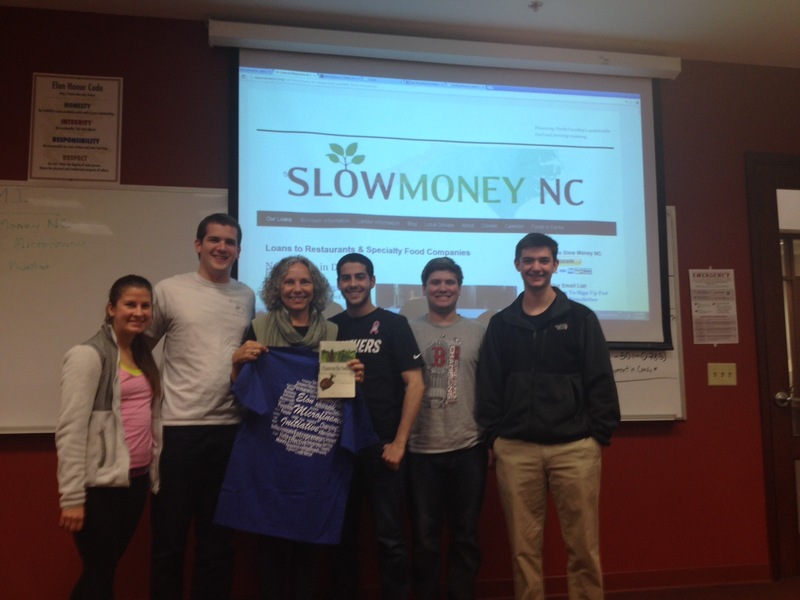 Slow Money NC Visits Elon. We rode the wave of progress and by the end of the 20th century our stores had filled up with ‘stuff’ from all over the world – as had our kitchen cabinets, and our bodies. Tangerines from Spain, dresses from Bangladesh and appliances from Japan. We burned through millions of barrels of fuel from the Middle East, and gave up control of our life savings to a globalized stock market. It all seemed harmless enough, and in exchange we got so much choice! So many creature comforts, and a promise that it would only get better and better. But that wave turned out to be a tsunami, and while globalization has merit, it has come with unforeseen risks and costs to our psyche, to our health, to our planet’s ability to sustain life, and thus to our resilience as a species. Today we are seeing a new wave, a new perspective on progress. One that is less extractive of our planet’s finite resources, and that reconnects us to home. The new paradigm is to re-localize – to get “Running On Local.” Local food, local fuel, local finance, local friendships, local fun, and more. In 2010 I heard an idea, espoused by Woody Tasch, author of Inquiries Into the Nature of Slow Money, of moving money into the hands of local sustainable farmers and the local food businesses that support them. It seemed we could make affordable loans to those folks who had a viable need for capital – money that banks and other conventional sources would not lend. I tried it and it worked. I’ve made several Slow Money loans and it has been a blast. I can stop by a farmers market, or Angelina’s Kitchen, a small Greek restaurant that serves local food, and I can visit with the friends I have helped. I can see that my small, low-interest loan has made a difference in their success. It’s heartening and hopeful. In the last three and a half years I have helped facilitate over 115 of these direct, peer-to-peer loans in North Carolina from about 80 different lenders to 55 farmers and food entrepreneurs. Many of those loans are already paid off. They total about 1.2 million dollars and they have kept people employed in their own businesses, put more local food in our stores and restaurants, preserved small farms, and strengthened local economies. It’s brilliant and simple. We can do this in communities all over the US and beyond. 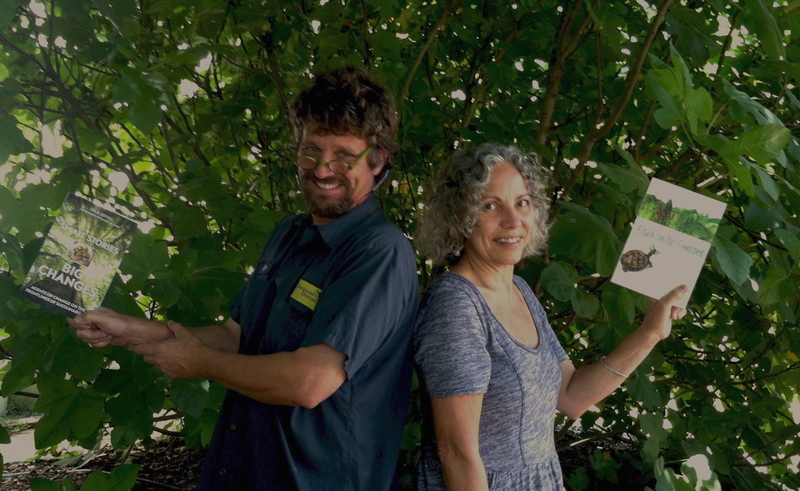 In our little town of Pittsboro, in rural North Carolina, we are “walking the walk” – with several farmers markets, a growing number of CSA’s (Community Supported Agriculture) and our very our coop grocery store, Chatham Marketplace. The Marketplace is now entirely financed with money from local citizens. We have a community scale biodiesel plant, a two-year program in Sustainability at our local community college, and a local currency. We have stories to tell. 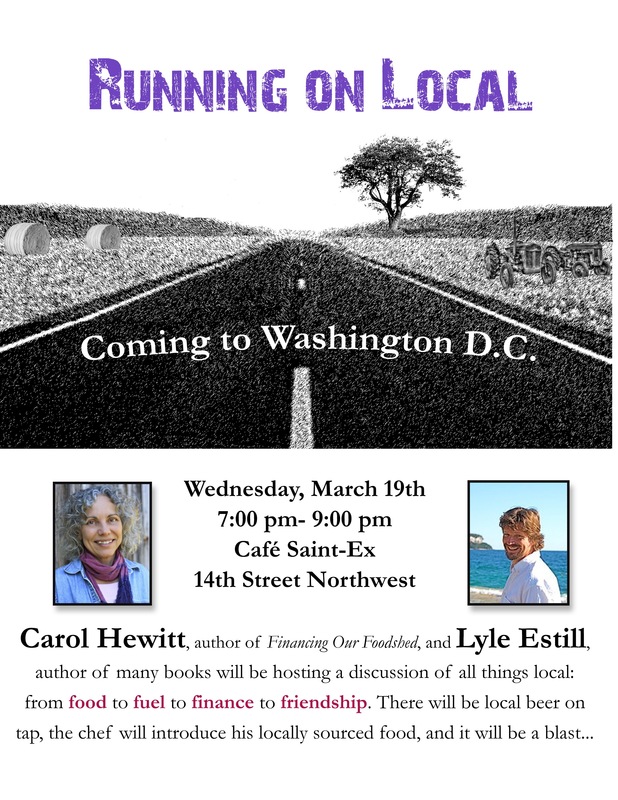 Fellow New Society Publishers author and sustainability activist, Lyle Estill, and I have created “Running On Local,” a sustainability roadshow to promote the merits of all things local. We are sharing those success stories and helping other communities to re-localize. He should know. He runs Piedmont Biofuels, one of the few surviving community-scale biofuel operations in the Southeast, turning waste cooking oil into about one million gallons of B100 biofuel each year. Together Lyle and I are going on the road to host powerful conversations in communities up and down the East Coast. We are taking our “Running On Local” message from Miami and Orlando, FL to Savannah, GA, and then on to Beaufort and Charleston, SC before heading up to Washington DC, NYC and Western MA. Come find us, or invite us to your area to help re-localize your community as well! We look forward to your joining us in this important conversation.